A local man called us up, to ask about the fish he catches each spring. With a group of friends, they fish for carp in local lakes. He does not eat the fish, and was wondering if we would want it for our compost. Fish meal has always been an item added to soil to improve the health of plants. The 3 sisters, a planting of corn, bean and squash (native plants cultivated by Native Americans) many times puts a fish in the hole for the plants to use as fertilizer. We don't have time to fish. If we did, we would likely head to the bay and catch flounder, then freeze it for cooking up all year. No compost feeding! 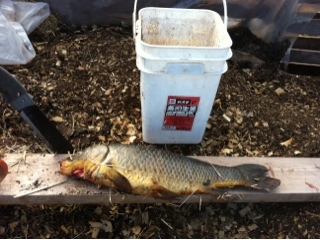 Yesterday our first carp delivery of the year showed up. With the machete, a bit was chopped up and then put into each laying hen pen. The girls were momentarily quiet, and then a concerted effort was made to consume that fish in no time. While a flock might have been doing their usual thing, when a chunk of fish appears every hen is totally focused, intent on tearing apart and eating every speck of fish. Every time we feed our laying hens something like this, it reminds us of the scenes in Jurrasic Park, where they tiny dinosaurs, as a flock, have a human for a meal. "Don't fall in the pen" we tell each other. Those sweet and beautiful girls can tear it up!